Israeli soldiers abducted, Thursday, nine Palestinians from their homes, in several parts of the occupied West Bank, the Palestinian Prisoners’ Society (PPS) has reported. The PPS office if Jenin, in northern West Bank, said the soldiers abducted Yousef Ezzat Shakarna, Mo’in Ibrahim Hamamra, Ahmad Mohammad Khaliliyya and Samer Mohammad Abbas. 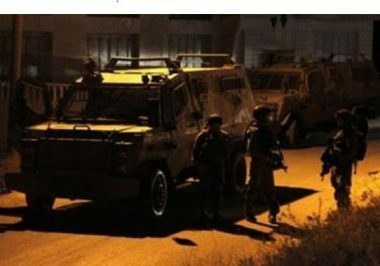 The soldiers also abducted Yousef al-Hamshari, and Mahmoud Shafe’ey, from Tulkarem governorate, in northern West Bank. Furthermore, the soldiers abducted Ma’an Samir Sweity and Mohammad al-Liddawi, from Jericho. In Hebron, in the southern part of the West Bank, the soldiers invaded the homes of Yasser Khalil Shreiteh, his brother, Taiseer, and Marwan Hussein Shreiteh, and ransacked them, before abducting Marwan.